Description : This wallet, manufactured from the Italian Tampono, is an ideal product for the traveler. It shuts with a leather loop attached to a press button. 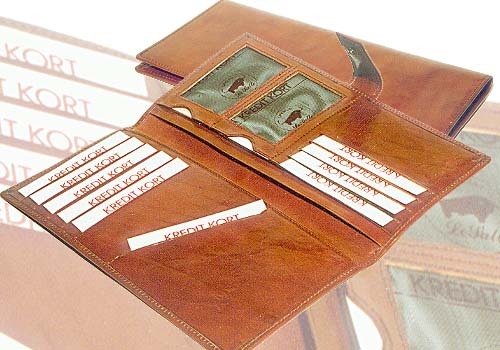 On the back of the wallet are two slots to accommodate boarding passes. On opening, the LHS has a slot to keep the passport and five credit card slots. There are two deep pockets on each side. The RHS has one more pocket for keeping any important travel papers. There are two small mesh pockets and 4 credit card slots.